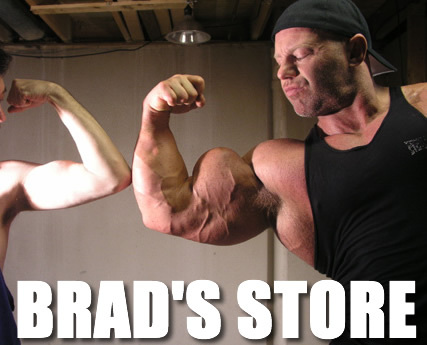 In this video, Brad shows you loads of up close posing of all his body parts, including 24+ inch biceps, 60 inch chest, 33 inch quads and 23 inch calves, in the gym, hotels and from his various travels. Brad is in contest shape in most of this footage and also shows some gym training. In one segment, he does hammer dumb bell curls with 160 lbs in each hand!!! Most of this footage was shot in the summer and fall of 2003 up to the summer of 2004. This is some impressive footage of one of the world’s largest and strongest bodybuilders.